You’re itching to hit the road, but can’t find the funds to do it. Still, you have some unexpected, maybe unwanted, free time on your hands and an urge to see the world. 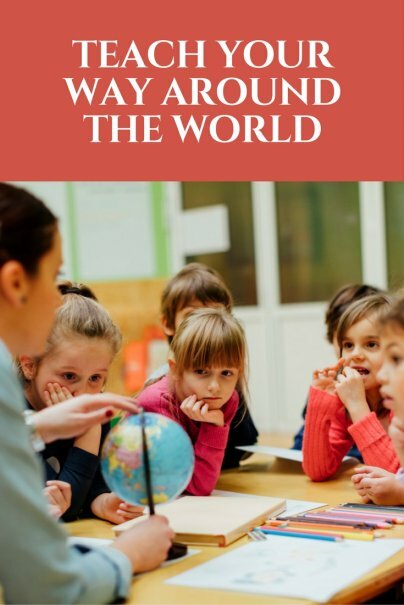 Now’s the time to check out the teaching abroad scene. Loads of jobs await in places near and far. From just across the border in Mexico to the furthest reaches of the Polynesian Islands, opportunities abound. All you have to do is get a few key elements in order and you can be off on the adventure of a lifetime. Having a Bachelor’s degree is the first step to hitting the road as an English instructor. In fact, in many cases, whether you have one or not will determine if you are even eligible to teach in a particular country. Some places, such as South Korea and Japan, require only a Bachelor’s degree and no other ESL teaching certification. So once you polish off this degree, you’re well on your way. It doesn’t even matter what subject you study, although if you have a degree in Education or English Teaching, it could give you a boost in an employer’s eyes. Other countries, such as Vietnam and Indonesia, require additional training. For Vietnam, you have to have a TEFL, Teaching English as a Foreign Language, certification. While you may be able to find a job without one, it’s more difficult and you have less access to the higher paying gigs. Working your way through the maze of certification programs can be a true challenge. Best option? Choose the country or culture you’d like to immerse yourself in and research what you need to do to get there. If you already know where you want to go, sweet! You can browse through programs for TEFL, CELTA, or TESOL certification programs and get to it. Go for the hands on, face-to-face courses and avoid the online ones, which employers don’t regard very highly. It shouldn’t take you more than a month or so part-time to polish off a course. Once you’re all schooled up and certified, you can get straight to the job hunt. Excellent places to start are Dave’s ESL Café, especially if you’re interested in teaching in Korea, China and other parts of Asia. TEFL.com also offers a wealth of opportunities around the world, as does Transitions Abroad. And those are just a few of the sites around. Search around and see what else you can find. For more formalized experiences and the support of an established organization, you can check out the Peace Corps, JET in Japan, Georgetown University’s English Language Fellow Program, or even some of the Fulbright programs. Some countries, especially places like Taiwan or some places in Eastern Europe, don’t respond to applications from afar. It’s easier to fly out and make an appearance in person to apply for a job. You’re taking a bigger risk by doing that, but if you have the funds and the time for it, it’ll give you a chance to see if you like the country and to find an employer you really like. A downside of finding an ESL teaching job in another country is that you never know what you’re going to get when you get there. Sure, the ad sounds great, the interview goes well, and the money looks solid. But be prepared for anything once you hit the ground. Sometimes the housing isn’t what was promised or the hours are more than expected. To mediate these challenges, make sure to do as much research as possible beforehand. Hit some job forums like the ones that Dave’s ESL Café has, and see if anyone knows about the school you’re talking to. Ask the school for the names and email addresses or phone numbers of people who are currently working there or have worked there in the past. Do a few online searches to see what comes up. It never hurts to have more information. It may not change your decision or what happens when you get there, but at least you have a bigger picture idea of what’s going on. If you can rustle up a few contacts – friends of friends of friends or acquaintances who know people in the spot where you’re going – even better. You can get some seriously authentic takes on what to expect and make a few new friends along the way. So get researching and studying. Soon you’ll be off on a super adventure, work-cation style. It's a good thing that you said that it's not all perfect. Really, it seems like a nice way to live.. for a year or 3. After that I think you have had it with that kind of life. If you posting this isn't a sign, I don't know what is! I'm still working on my degree but once I obtain it, I will be pursuing this exact career. I still want to freelance, but doing it full-time is rough - especially these days with content rates going lower and lower. It's pretty scary. Anyways, thank you so much for posting this. I was feeling very discouraged recently due to having had a really, really hard month and taking on a course that is much too hard and uninteresting. After reading this, I feel empowered to keep going. I taught at an American boarding school in Europe in the mid-90's, with the hopes of learning a new language and experiencing immersion in another culture. My advice: if at all possible, look for a day school. I was not able to take language classes or spend time in town in the evening due to nightly dorm duty, library duty, study hall supervision, etc. It was like being stuck on a very small island of the U.S. My opportunities to travel were limited to school-sponsored trips--imagine seeing Florence or Rome for the first time with 30 ninth graders to supervise 24 hours a day. There is a great deal of turnover in the faculty of these boarding schools which means that students are sometimes reluctant to trust adults with their personal issues, exacerbating problems with eating disorders and substance abuse. It's hard on everyone when the person who says "You are grounded" is not the same person who says "I love you" and gives you birthday presents. On the other hand, if you have some teaching experience already, I have heard good things about the Department of Defense Schools. You may still be on an "island of the U.S." but at least your students go home to a family setting in the evening, and you are free to manage your time as you see fit. I highly recommend the JET Programme (I went 2000-2001). It was a great way to get a taste of Japan, meet people, and helped me get back on my feet after having no affordable housing in San Francisco (my farm house in rural Japan was rent free). This is actually where I am in life right now. I'm teaching in China and I love it. The pay isn't so good. It's definitely not the best way to make a lot of cash, but I live and travel just fine. I really recommend going through a program if going to a country that you know little about. Mediation is difficult, especially in a country that doesn't speak your native tongue. But countries like China, Japan, Korea, Thailand are overflowing with jobs for teachers. Just be careful and have fun. I'm an English teacher in Brazil, and know a lot of other teachers around the world. I love both teaching and living abroad and plan to do both for a long time. I have two comments about this article. The first is that you should make sure you actually have the patience and desire to learn how to teach well. This isn't an easy ticket to travel... This is a job and a life, and learning English is often a critical factor that determines the choices and access your students will have. One of the best things you can do is put yourself in their shoes and learn another language in a classroom (if you haven't already). In any case, be sure you actually like to TEACH, because that's how you'll be spending most of your time. The second is that the good, hands-on TESOL certificate programs are not something you can finish in a month part-time. They are generally either part-time for several months or full time for four to six intense weeks. Be prepared to work, and be ready to make a commitment. Why? Because the good ones should give you the basics of teaching theory, teaching practice, and an overview of the English language itself. I highly recommend doing one (I didn't, I threw myself in with no experience, and then jumped straight to getting a masters in teaching TESOL, but it would have been a good foundation and made my first year a lot easier, and been better for those first students). Another route, if you'd rather teach another subject, is to get your general teaching certification and apply for jobs at international schools, which are always looking for subject teachers who want to live abroad. I agree with Maggie. The JET programme is a great thing to do. I was there in Hiroshima from 2002-2005.